In the 1800's the Otoe-Missouria lived on the prairies and made their homes along the Platte and Grand Rivers. "They hunted bison and grew corn, squash, and beans in the river valleys. Patrilineally related families lived in large earthen lodges in permanent villages and, when hunting the bison, occupied tipis in smaller family groups. Both men and women cultivated the gardens, but the greatest share of the horticultural work fell to the women. 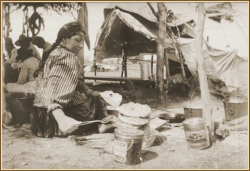 Men were hunters, but women cut and dried the bison meat, distributed it, and prepared the hides. 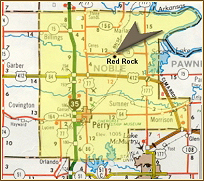 In this location, along Red Rock Creek in what is now Noble County, Oklahoma, the tribe came into closer contact with various other Native Americans removed to reservations in Indian Territory. Within this geographic region, the various tribes were different in many ways. Each tribe had its own particular customs, clothing, and way of living life every day. Moreover, as Indian Territory was opened up to settlement, Native Americans had to learn to live with European Americans, African Americans, and others who came to Oklahoma to find a new home. This dynamic process continues with new people arriving from Asia, Latin America, and other places.